Do an extra two doors make any difference? 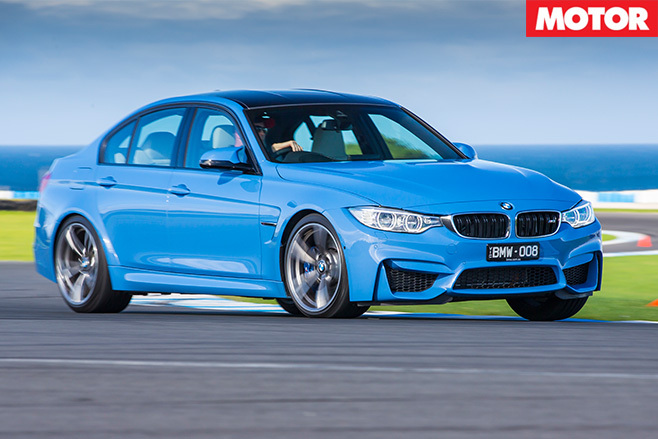 Having devoted plenty of ink to BMW’s new M4 coupe, we thought it was time we covered its sedan sibling, which retains the iconic M3 badge. This marks the first time MOTOR’s had the luxury of covering the two- and four-door concurrently – in the instance of the E36 and E90 the sedan appeared two years after the coupe. And, in E30 and E46 guise, there was no M3 sedan at all. Differences between the sedan and the coupe are relatively minor. At 1520kg for the manual and 1560kg for the standard DCT, the sedan weighs an insignificant 23kg more than the equivalent coupe, mainly due to it lacking a carbonfibre-reinforced plastic (CFRP) bootlid. It’s also 41mm taller than the M4, so it has a slightly higher centre of gravity. Unsurprisingly, on the road such small differences are undetectable, as both feel prodigiously fast. The claimed 0-100km/h of 4.1sec is perhaps optimistic, but mid-4s should be easily and repeatedly achievable. With 550Nm available from 1850rpm, the M3 pulls hard from virtually idle and sustains this urge right up until its 7500rpm peak. For both cars, the fact there’s no incentive to chase the redline anymore is perhaps a shame, as it no longer matters whether you change up at 5500rpm, 6500rpm or 7500rpm – the speed is about the same. More contentious will be the noise. What you hear in the cabin is a digital recording of the exhaust note played through the speakers, and to these ears it sounds like a highly tuned early Porsche 911. Also up to the individual is the preferred combination of settings. 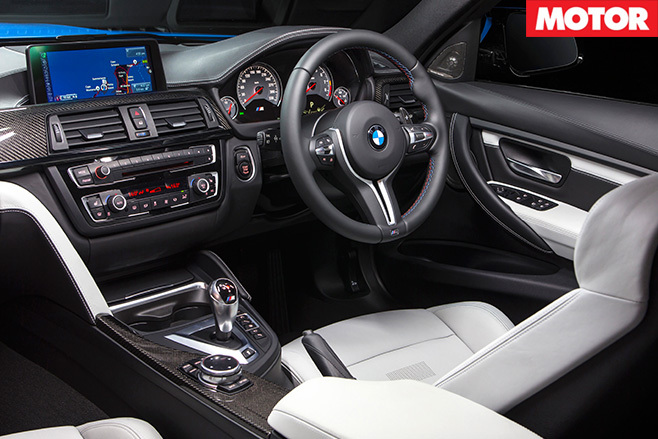 There are three settings for steering, suspension, engine, gearshift speed and DSC, and your favourite two combinations can be saved to the M1 and M2 buttons on the steering wheel. For me, M1 stores everything in Comfort for cruising, and M2 is all-out attack: Engine in Sport+, suspension in Sport, steering in Comfort, medium gearshift speed and DSC in its more lenient MDM mode. Sport+ suspension is best left to very smooth roads or racetracks, and the sportier steering settings add weight but then no extra feel. Apart from requiring some finesse at low speed, the seven-speed dual-clutch gearbox is superb, though the fastest gearshift setting gives an unpleasant thump in the back on upshifts. It would be a very brave or talented driver that drove with DSC off on the road. On dry roads the new M3 is incredible. Grip at both ends is enormous and you can play with the car’s balance almost at will. Add some moisture and things become hairier. There’s still plenty of grip, especially at the front, but it tends to run out quickly and with little warning. The immense torque also means wheelspin is now an ever-present threat, even in fourth gear. The only other blot on its copybook is the intrusive and continual road noise, likely a result of the rear subframe being bolted directly to the body. It spoils what is otherwise an incredibly accomplished grand tourer, as the ride is brilliant and the interior both comfortable and lavishly appointed. The M3 looks angrier and more aggressive than the M4. The fact that it’s also $10K cheaper seals it as the best M-car currently on sale, though it’s one best enjoyed on dry, sunny days.